﻿ How do you make your eCommerce Site Stand Out from the Crowd? What is a website or an ecommerce site of a company? If we get into the technicalities of it, many experts will come up with various technical answers. However, in a layman’s language a website is considered the face of the company. It is something that gives face value to the organization. Through a website, a company can tell everything about it to the world. Starting from the past, present, history, offerings, testimonials or the offers and discounts, everything can be depicted on a website of an organization. Now, whether it is a huge MNC or a small startup, every organization firstly gets a website made for their firm so that they are able to convey their offerings to the world. How is an ecommerce site the face of your company? One of the biggest advantage that an ecommerce site offers to any firm is the fact that it helps them give a face to the company. Website is a great want to represent the company, and convey the offerings. Plus, at the same time, it is a great solution to showcase your strengths to the world. Every company can have their own, uniquely designed ecommerce site, which is developed aptly for a particular firm. This specific ecommerce site will help the company to showcase their offerings in any way possible. The most noteworthy benefit of getting a website made is also that you can let the customers know a lot about you. Be it how you started, and how far you have come. Or, information about your work culture. You may even add some insights about how much effort you out in when it comes to offering a perfect product or a solution to your customers or clients. What are other advantages offered by an ecommerce site, then just giving a face value to your company? Reach out to a million of them One of the best advantages of making a website for your company is the fact that it lets you reach out to a large group of people. Without any geographical boundaries, you are free to connect with huge customer base. The eradication of the topographical constrains automatically leads to more traffic, transaction and revenue, as now, you are able to sell your services or products to a larger spectrum. This also helps you to make your company a popular name. Ramp up your revenue Why should get an ecommerce site? Well, simply because you want more and more revenue. Ecommerce market is blooming at the moment. 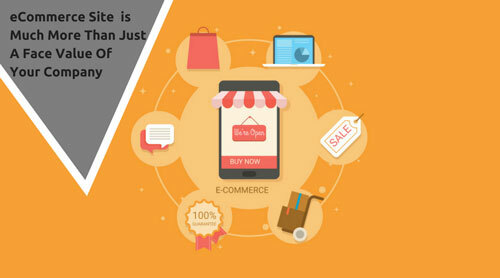 Therefore, if you have a wonderful ecommerce site, which has the capability to attract the target audience then you have more chances of boosting your business. Such ecommerce sites, which are able to catch the fancy of more target audience, and is also able to help them get what they want do wonders for the company. You will not only get more transaction at that instance, but a good Magento ecommerce development services & experience will encourage the customers to visit your site again and again. Keep an eye on your audience As, ecommerce sites are all digital, therefore, there are a lot of analytics and numbers which can be generated through them too. Firstly, you can easily get a lot of knowledge about your target audience through the behavior of your visitors. Such insights can not only help you to expand your business, but will also help you to curate much better marketing campaigns in the future. Such type of information further helps to attract more customers, and get more leads. Inventory Management is a cakewalk An ecommerce site also helps you to save a lot of your money which you otherwise spend on the operational tasks. With the help of a well-designed ecommerce site, you can easily automate the complete inventory management process with the help of the web-based management programs. This will not only help you to save money, but will also make the whole process of inventory management a lot quicker, efficient and smoother. An ecommerce site offers a lot of advantage, like it also helps you to be competitive and more presentable. At the same time, the advantage of being available round the clock, and reaching out to a greater area are few of the other major things. It is just that, you have to spend some bit of time in creating the website as it should have the essence of your company as after all, it does much more than just offering a face value to your firm!